Delivering an engaging customer experience for large-scale, global marketing campaigns is no easy task. This requires organizations to possess a supporting mechanism that facilitates large-scale marketing promotions, backed with a highly scalable, elastic, and secure infrastructure to manage rapid traffic inflows. For organizations, the biggest challenge is usually to ensure smooth handling of expected website traffic, latency, and to provide a pleasing customer experience. To effectively handle unpredictable website traffic, Alibaba Cloud's elastic computing capabilities enable users to scale their resources to meet traffic demands. 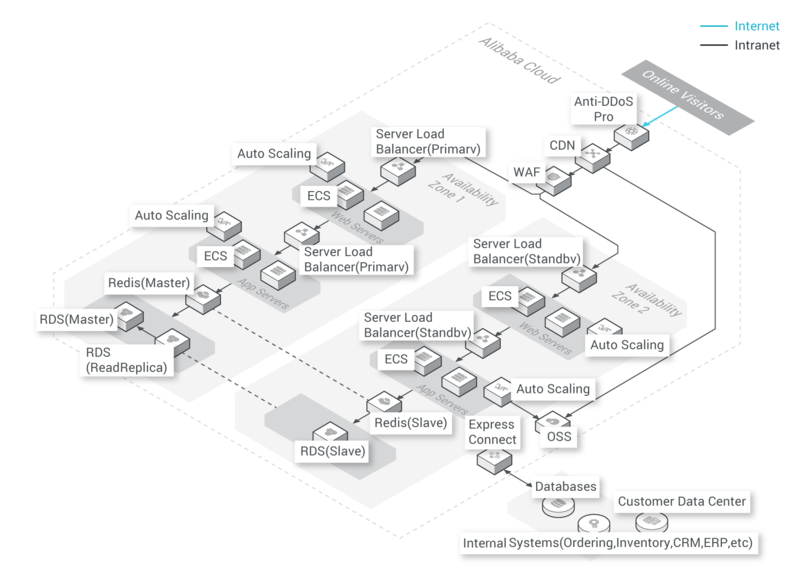 Auto Scaling helps to configure both front-end web servers and backend application servers of a campaign site. With Alibaba Cloud's CDN distributed over 500 locations globally, the system can accelerate media-rich files for marketing campaigns globally and ensure an enhanced customer experience. Leveraging ApsaraDB for Redis between applications and database minimizes data response time and reduces database workload. ApsaraDB for RDS addresses typical database performance bottlenecks during large-scale campaigns. It also supports the read-replica feature to avoid overloading the primary node by distributing read requests to read-only nodes.